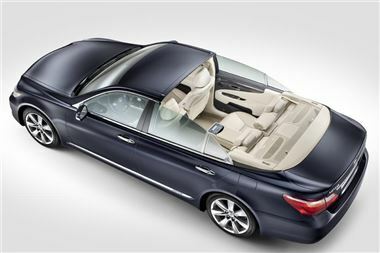 A unique, full hybrid Lexus LS 600h Landaulet fitted with a one-piece transparent polycarbonate roof will serve as the official royal wedding car when His Serene Highness Prince Albert II of Monaco marries Carlene Wittstock in Monte Carlo on 2 July. The conversion was undertaken by Belgian coachbuilder Carat Duchatelet, working closely with Lexus engineers based in Brussels. The project took more than 2,000 hours to complete, with a focus on maintaining the levels of quality and technological sophistication that are fundamental to every Lexus, and preserving the performance, safety and dynamic attributes of the original LS 600h L.
The process began with computer-aided design calculation, simulations and 3D modelling. Reinforcing the bodyshell required extensive use of honeycomb structures Kevlar and carbon fibre composite materials to achieve suitable chassis stiffness and torsional rigidity following the removal of the roof and pillars. Composite parts have to be cured at very high temperatures and these were literally ‘cooked’ on to the bare chassis in a specially prepared oven. This meant that first, much of the vehicle had to be dismantled, with around 20,000 mechanical parts, electric component and interior features and upholstery being stripped out. Re-assembly was carried out under close supervision of a Lexus engineering team to ensure consistency with original vehicle specifications and performance. Prior to re-assembly, the car was finished in an elegant Midnight Blue livery, applied by hand using several coats of a bespoke, water-based paint, adding to the car’s environmental credentials. The transparent roof presented a challenge in both design, as a large, single piece with no reinforcements or pillars, and in manufacturing. To make the roof, Lexus sought co-operation with a French company that specialises in supplying similar components to the aerospace industry, such as helicopter windscreens and fighter jet canopies. The roof is a single, lightweight polycarbonate shell that is 8mm thick and weighs just 26kg. Fixed to the body of the Lexus through two intermediary parts, it allows a perfect view in and out of the car. A template was made in a honeycomb structure and carbon fibre to validate the roof’s shape and structural integrity and to ensure a perfect fit with tolerances of less than 1mm. Once the design was complete, robotic tools were used to produce the canopy and fit it to the Landaulet in a completely automated process. The final stage of the conversion, re-assembly and finishing took a team of 10 specialists working with Lexus engineers more than two weeks to complete, to ensure the highest quality levels were achieved. On the day of the wedding the LS 600h Landaulet will be used by the royal couple to tour the principality after the marriage ceremony. For most of this distance the car will operate in its fully electric mode, with zero tailpipe emissions. After the celebrations the car will be displayed at the Media Centre and later the Oceanographic Museum in Monaco.